Jumpstart, the children's educational gaming brand name behind award winning children's learning based computer games has launched an online 3D Virtual World at jumpstart.com! I cannot say enough good things about jumpstart.com! We are enjoying our online membership immensely! I'll break down my "shameless plug" into 3 parts. When you first enter the site, you are greeted with an energetic video explaining what the new 3D world is all about. Once you register and create an online account for your family-you can enter up to five names per household, you can start exploring! We learned best by just diving in and exploring as we went along. We are a bunch of kinesthetic learners! The kids had a little difficulty at first attempting to navigate the keyboard to get around, but once they figured it out, they haven't looked back! I think that was mostly due to my kids not being very used to playing on the computer. Jumpstart occasionally provides visual prompts (like "Use the space bar to jump up.") and those really helped! Also, there is a map detailing out the Jumpstart world-which has become a "go-to" for my kids. If ever they are unsure of where to go or what game to play-they head to the map and presto!-it's all right in front of them! The entire worlds is geared for 3-11 year olds, but is broken down into lands that focus more on a particular age group. 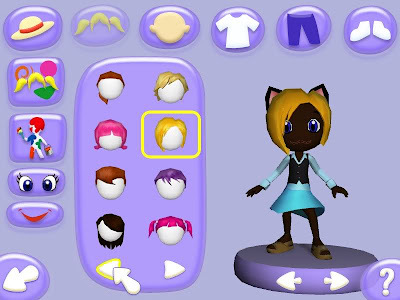 When you register and create an account for your child, your child will get to create their very own "Jumpee" which becomes their online personality (similar to the Wii's Mii persona). 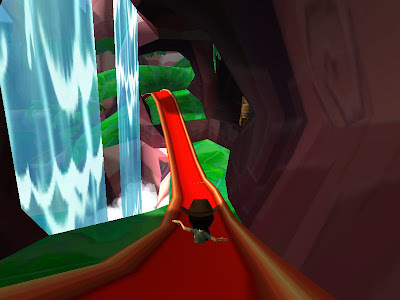 This Jumpee interacts all over the Virtual World and is integral to interaction in the world. Jumpee's come with a limited basic wardrobe and the more you explore the world and play the educational games, the more coins you collect to be able to use at the virtual clothing store-JS Threadz! **One of my daughter's favorite parts of the Jumpstart 3d Virtual World is the "Movie Theater", where they show short videos and songs! She knows them all and loves to sing along! True to what Jumpstart is all about, learning is infused into every aspect of the 3D world! You hardly realize there is learning going on with all the fun that is being had! From the Jet Pack Game, where using your jet pack, you fly into letters to practice letter and phonetic identification to JS Threadz, where you can spend the "coins" you earn from playing games on brand new virtual clothes for your Jumpee-learning is a part of it all! Membership to the site gains you access to the many downloadable games where you can extend all the learning possibilities and fun! Your child's progress can also be tracked online and even emailed to you! I received an email just a few days ago detailing out which games my daughter had completed and what learning aspects they worked on (like shape and letter recognition)! Jumpstart also has a blog attached to the 3D world and it is full of tips, tricks, and ideas for parenting as well as the Jumpstart site! The ping pong ball game inspired me! There is so much we have yet to unpack at the Jumpstart 3D Virtual World. My kids are making use of their membership everyday! It has, unintentionally become a great discipline tool. It's their favorite thing to do right now, so we get a quick response, if their is a chance it might be taken away! You are so right, this is an awesome game! My daughter (who has special needs) has played Jump Start World since before you could do it online and it has been a tremendous tool for her. We love the online world because there is even more for her to explore and do. It's so great to have such a fun game that helps them really learn! Thanks for this. I have yet to have the boys play with the computer. But maybe I should start - I just know there going to be a big fight because of sharing one computer!! Just not ready for it!! But looks like a great place to start! Thank you for posting this. I've been trying to let my children use the computer more. Since I have triplets we use a timer for sharing the computer so each child gets 15 minutes at a time.